"4 Carringer, Lyle L. 7 May 17 [Enlisted] 6 May 21, "Expiration of Enrollment"
"U.S. Marine Corps Muster Rolls, 1798-1958," indexed database and digital image, Ancestry.com (https://www.ancestry.com : accessed 17 September 2018), T977 > US Marine Corps Muster Rolls, 1893-1958 > Roll 0201, Sheet No. 463 (image 467 of 682), May 31, 1921, Lyle L. Carringer entry; original data in U.S. Marine Corps Muster Rolls, 1893-1958. Microfilm Publication T977, 460 rolls. ARC ID: 922159. Records of the U.S. Marine Corps, Record Group 127; National Archives in Washington, D.C.
Lyle L. Carringer enlisted in the United States Marines Reserve on 7 May 1917 at the Marine Barracks in San Diego, California as a Private in MCRs Class 4. There are 24 muster cards like this one from May 1917 to December 1921 with some cards missing. He served throughout his enlistment in San Diego. I don't know how much time these Reserves had to put in each day or week - perhaps it was a full-time job. Lyle was married in June 1918 and I believe that he commuted to this job in Balboa Park - probably on the streetcar (down 30th street to downtown San Diego), and then up the Balboa Park streetcar line to the Marine encampment. 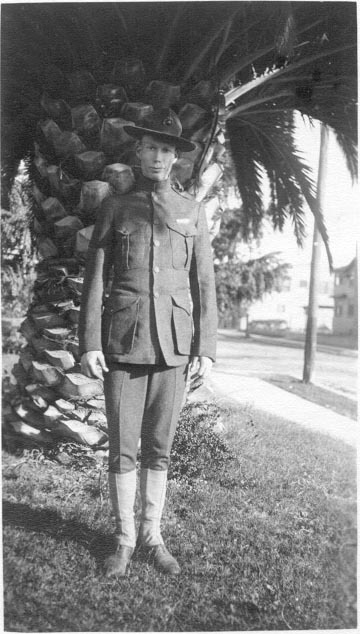 Lyle L. Carringer (1891-1976) is my maternal grandfather, who married Emily Kemp Auble (1899-1977) on 19 June 1918 in San Diego.